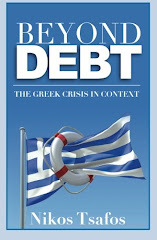 Alongside economic collapse and social unrest comes the gradual but steady disintegration of Greece’s political system. The latest poll by Public Issue shows not just growing frustration and discontent (nothing new), but also the public’s eroding faith in Greek political institutions, parties and personalities. The political system is marked by its absence rather than its presence. Only 7% of the public are satisfied by how the government is handing the country’s problems; the number is marginally higher (10%) for the main opposition party. Only 11% think that a PASOK government is best suited to handle the country’s problems, which is the exact same percentage as a New Democracy government. A mere 1% has faith in a joint government and 73% trust neither. The two most popular politicians are leader of far right LAOS, George Karatzaferis (38% positive) and Alexis Tsipras of leftist SYRIZA (36%). The leader of the opposition, Antonis Samaras, follows narrowly behind (35%). Prime Minister George Papandreou’s popularity continues to tumble and fell 7 percentage points in October 2011. Only 22% think that Papandreou is the most appropriate prime minister versus 28% who think that Samaras is; 47% think neither. 36% think that best solution in the next election would entail some political compromise either in the form of a broad unity government (18%) or a PASOK-ND coalition (18%). A majority (57%) thinks the country will head to early elections, while 33% think the government will exhaust its four years in power. A growing share (39% vs. 14% in January), think the country needs elections. An equally growing share (now 59%) believes that ND would win those elections. The intention to abstain has stabilized at roughly 34% and has come down marginally since the summer when it peaked at 38%. Such political vacuum is at once an obstacle and an opportunity. An unpopular government is less likely to pass tough reforms and be able to implement them. But it is also an opportunity to wipe clean the political slate. Greece needs a new social pact – one that replaces patronage and corruption with political coherence and accountability. Disillusioned by the inability of the current leadership to provide, well, leadership, the Greek public will search for and embrace alternatives. That search can lead to either of three outcomes. The first outcome is polarization with growing support for the extreme left or extreme right. The Greek public, in this scenario, will seek a simpleminded but all-encompassing narrative that concentrates blame on someone (foreign capital, immigrants, etc.) and that absolves the Greek public from the need to be introspective and look for ways to improve itself. Support for LAOS and, to a lesser degree, SYRIZA can be seen in that light. A second outcome is cynicism and disengagement. The public basically gives up on the political system, accepts that all politicians “are the same” and that corruption is too endemic to fight against. The political system becomes, therefore, more clientelistic as narrow personal interest remains the only medium for citizen-political interaction and any vestiges of hope and political ideology fade away. In that scenario, Greece will devolve into a (pre Arab spring) Middle East-type society where extreme cynicism trumps political ambition and participation and where the belief that “nothing can change” defines public life. A third outcome is a new liberal social contract. The Greek public becomes progressively cynical, as above, but it finds, within that cynicism, some kind of hope. That hope comes from deep in the Greek psyche and remains, at first, impossible to articulate. It taps into the thirst for accountability and meritocracy, and it feeds on the hope that things can and will change. Such scenario needs a strong leader – young, articulate, idealistic – who will paint a picture of Greek society in 2020 and form a broad but plausible agenda on how to get there. That leader would basically tap into growing frustration and re-galvanize the Greek public to give the political system another shot. “Lewis (chief domestic policy advisor): People want leadership. And in the absence of genuine leadership, they will listen to anyone who steps up to the microphone. They want leadership, Mr. President. They're so thirsty for it, they'll crawl through the desert toward a mirage, and when they discover there's no water, they'll drink the sand. Another thought provoking and informative piece, Nikos. Many thanks. When Germany was faced with its own 'national catastrophe' in 1945, it partook of the biggest bail-out in history, the Marshall Plan. Backed up by this lifeline, it went on to resurrect itself in a way that has earned it universal admiration. Likewise Japan. In my view, they were able to do this because certain underlying qualities were still there despite the appalling circumstances in 1945. Chief among these were: a capacity for self-organization; a highly skilled and well-qualified workforce; patience, discipline and determination. Do you see any of these virtues in the current Greek population? My point is simply that it has nothing to do with 'filling a political vacuum'. The Greeks - through the choices they have made since 1981 - have corrupted themselves to the point where their human resource potential is precisely zero. Hence, there is no collective way out of this crisis for them. However, there are a few individual strategies that seem logical - and some Greeks are already employing them. That is: emigration, peasant cultivation through a return to the countryside, and suicide. Let's just call them the fourth, fifth, and sixth scenarios! The second biggest issue after the Greek economy is illegal immigration. In Greece today there hundreds of thousands of illegal immgrants which is costing Greece hundreds of millions of euros each year in free medical services and other social services. Most illegal immgrants are working in a cash economy and sending millions of euros overseas, 85% of all crimes are committed by illegal immigrants. There is no will by PASOK to give them a deadline to leave or forcibly deport them on EU funds. This PM is weak on illegal immigration and it is estimated that there are 200.000 illegal mainly Muslims in the heart of Athens. PASOK did sign Dublin II in 2003 which has worked against Greece and the PM is not doing much to turn it around which would be cost saving exercise for Greece. A great summarize of the political situation in Greece! Good to see that reason and analytical thought ain't dead yet in that country. Sadly, there's too meuch evidence to the contrary in the news reports. And that makes scenario #1 the most likely one, imho. Afaics, the protests show that people haven't become cynical yet, but will become easy prey to whoever demagogue, Karatzaferis or Tsipras, feeding them with the more compelling narrative. Of course, neither of them have offered any realistic plan yet, but carefully avoided to be nailed down on any specific points, so any government that includes those power hungry pseudo leaders can only be even more of a desaster than the current one. In the medium run, imho it will boil down to scenrio #4, which you didn't dare to mention: A new military dictatorship! The retired officers protesting against the government show that this is a very real danger. I sincerely hope that this won't happen, but, honestly, virtually othing I read about Greece in the last weeks inspires any confidence that this dysfunctional nation can make a turnaround and succesfully engage all its problems. It seems it takes a miracle, or maybe a popular but responsible new leader emerging from nowhere, to change that very dire outlook. The latest poll by Public Issue shows not just canister vacuum ratings growing frustration and discontent (nothing new), but also the public’s eroding faith in Greek political institutions, parties and personalities.